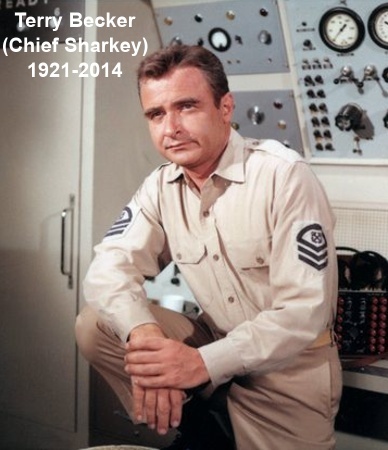 It is with deep sadness that we have learned from his family that our dear friend Terry Becker, Chief Francis Ethelbert Sharkey from Voyage to the Bottom of the Sea passed away on Tuesday 30th December 2014. We are so glad that Terry and his wife Linda were able to attend and enjoy the Voyage to the Bottom of the Sea 50th Anniversary Reunion in October 2014, and that attending fans were able to enjoy Terry’s wonderful and mischievious sense of humour. We have much to remember Terry by, with his outstanding attendance at the 1998 VIP convention in Sheffield England, and so many fun appearances in Irwin Allen’s Voyage to the Bottom of the Sea. After some private grieving time and a family service on 5th January, his family have created a very special online memorial where you can leave messages of condolence. Our love and heartfelt sympathies goes to everyone who knew and worked with Terry over his long and illustrious life.